Just a quick follow up in regards to our new manager. 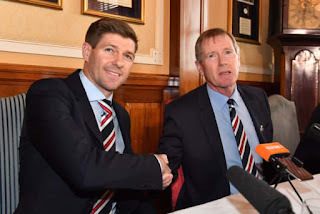 First of all I presumed these negotiations were ongoing in Glasgow not London sorry about being so presumptuous, Steven threw me a curve ball with his comments on BT Sport. Also all over the media it’s been said that there must be guaranteed funds and that was the stumbling point to get this over the line. I can assure you all that was not the case. That was swiftly sorted out on Monday morning as ‘item A’ in the discussions. Honestly think about it? If ‘item A’ wasn’t resolved item B wouldn’t have even been on the agenda simple as!! 1: Steven has final say on transfers, not Mr Allen. Obviously they have to work in tandem but Steven can veto any proposed transfers he’s not happy with. 2: Very similar to #one, he has total control of his backroom staff. 3: Is on a personal note for Steven; it pertains to the percentage he gets on marketing with his brand name on it. Before you ask, no, I don’t have a clue what the percentage is. Yesterday we got the result required, not pleasing to the eye but three points all the same. Two massive games now coming up and the whole team now looks mentally & physically burnt, Tav struggling to get past half way while Morelos has played straight through with no break all on his own up there all season. He needs some much deserved R&R as do the whole team. We need to play some of the fresher players for these last two games, Goss, McCrorie, Docherty, Rossiter and possibly young Glenn Middleton should be heavily involved in our last two outings just to get us over the line. The club must get a Europa place and at this stage honestly I would bite your hand off for 3rd place. I know we should never settle for that scenario but with what’s happened since Friday if you’re anything like yours truly my mind-set is truly focused on June 1st. In other news our chairman has called a press conference on Monday before he heads off back to Johannesburg on Tuesday morning. Strong Strong rumours it’s about major investment in the club, hence the two Director seats being made available. It also tells me there’s more than one investor. We shall see!! If that’s the case it’s been some four days for Mr King; fly over throw 2 hand grenades in and disappear back to South Africa. The other half of the city has been in total meltdown since Friday, My God have you seen it on social media? Wow!! If he announces significant investment come Monday please try not to gloat too much!! Also I have been told a major drinks company has approached the club about either investment or sponsorship, which is at a very, very early stage so I have to get back to you all on that one. They haven’t even sat round the table on that as yet, as soon as I hear anything I’ll be back in touch. Things are definitely getting better! I actually enjoyed yesterday’s game. Appart from Boyd’s freekick and the follow up we looked far more solid. Holt disappeared though, and Halliday was everywhere. But better team and better tactics. It was just hard work with Kilmarnock having 10 in there own box, but it was a pleasing result. Btw Alnwick looks much more an all rounded GK than Foderingham. Investors with shedloads of money needed. Shut the fk up with negative vibes PLEASE. This is a massive moment that needs EVERYONE behind with smiling happy faces and with loud singing voices. We Deserve it. By Fk we do. Murray could never be trusted with finances, ever again and was the problem that got us broke. That talk is crazy. He just strolls in, after screwing us over, in which might be a decade all told, to get back to where we are?? No. That would be a slap in the face to all bears. Stop, with that Murray talk. I don't care if the new investors are Hitler, Fred West and Lord Voldemort - so long as we stop those animals getting 10 in a row. And congrats to Stevie Naismith for his "tackle" on Broony today - if only one of our lot had the balls to do the same! Well said John! I one hundred percent agree!